IEPI: Calque 4 is out! 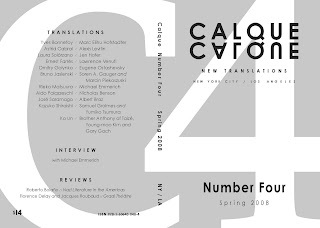 Featuring work by Yves Bonnefoy, Astrid Cabral, Laura Solórzano, Ernest Farrés, Dmitry Golynko, Bruno Jasienski, Rieko Matsuura, Aldo Palazzeschi, José Saramago, Kazuko Shiraishi, and Ko Un, translated respectively by Marc Elihu Hofstadter, Alexis Levitin, Jen Hofer, Lawrence Venuti, Eugene Ostashevsky, Soren A. Gauger & Marcin Piekoszewski, Michael Emmerich, Nicholas Benson, Albert Braz, Samuel Grolmes & Yumiko Tsumura, and Brother Anthony of Taizé, Young-Moo Kim & Gary Gach, along with an Interview with Michael Emmerich by Jeff Edmunds, and reviews of Roberto Bolaño's Nazi Literature in America (New Directions, 2008) and Florence Delay & Jacques Roubaud's Graal Théâtre (Gallimard, 2007). Do yourself and society a favor and order your copy right now, under the Subscribe tab.